Members of the ICA Fund Good Jobs team with Congresswoman Barbara Lee in Washington, DC. A contingent of the ICA Fund Good Jobs team joined the Community Development Financial Institution (CDFI) community at the CDFIs Invest conference in Washington DC this week. The conference, in its 32nd annual iteration, is the preeminent event for the CDFI industry, a wide-ranging network which spans the gamut of mission-driven lending organizations from around the country. The team, was able to attend the conference thanks to a generous grant from The Surdna Foundation. Nina, Kot, Yui, and Rasheed, led by Sean, explored new partnership opportunities in the industry, explored new ways of approaching the mission, and focused on establishing new funding relationship with an eye to long-term organizational sustainability. 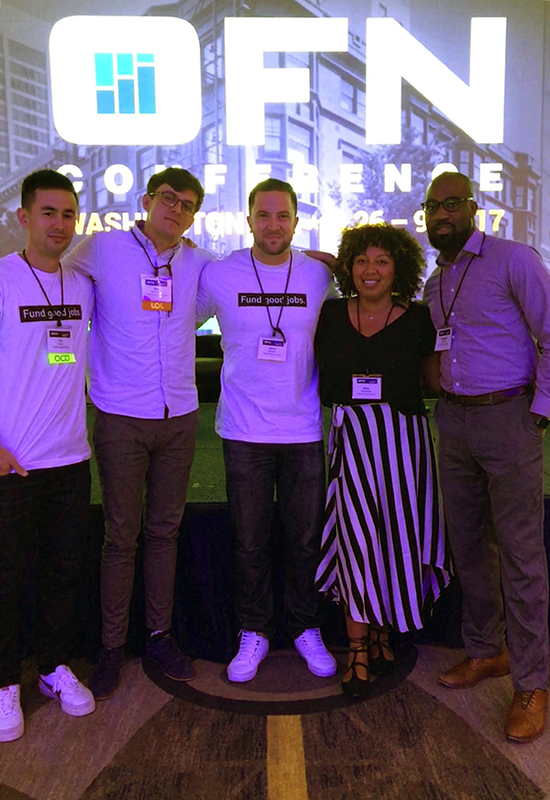 from left to right: Yui Ueno, Kot Hordynski, Sean Daniel Murphy, Nina Robinson, and Rasheed Mitchell at CDFIs Invest in Washington, DC. The team also made a close connection with Growth Opportunity Partners, a Cleveland-based CDFI lender dedicated to working with dynamic job-creating small businesses – a mission not unlike our own, except in North-Eastern Ohio. The two organizations spent much time together networking, sharing experiences, learning from each other's work, and not discussing recent NBA history. Last but not least, we met with Oakland's Congresswoman, the Honorable Barbara Lee. Representative Lee and her team welcomed the ICA Fund Good Jobs contingent in the chambers and posed for a quick photo after a busy day in Congress. After two and a half jam-packed days, the conference wrapped up on Thursday afternoon.